Easily stow the ball and mounting platform on this heavy-duty, dual-ball ball mount beneath your hitch for a sleek look when you are done towing. Tow up to 7,500 lbs with the 2" ball or 21,000 lbs with the 2-5/16" ball. 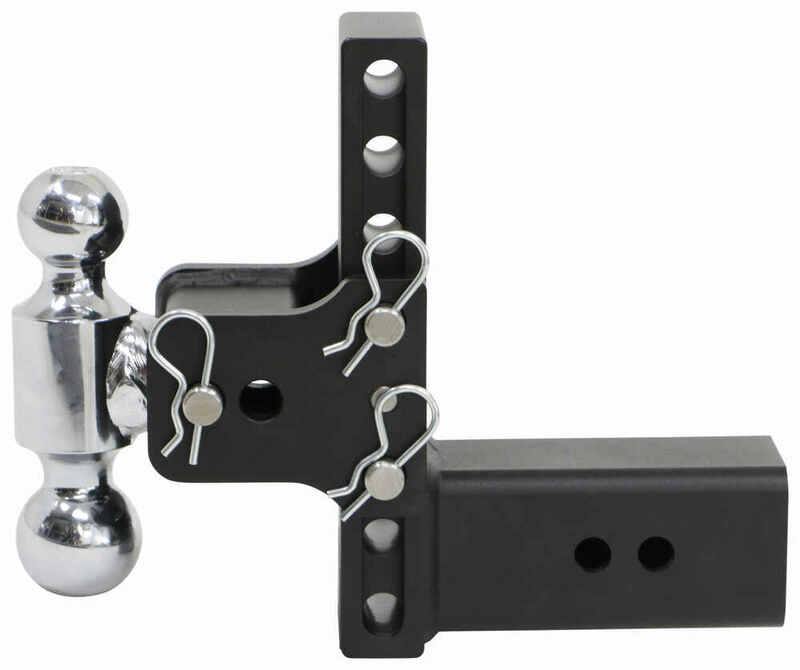 Call 800-298-8924 to order B and W ball mounts part number BWTS30040B or order online at etrailer.com. Free expert support on all B and W products. 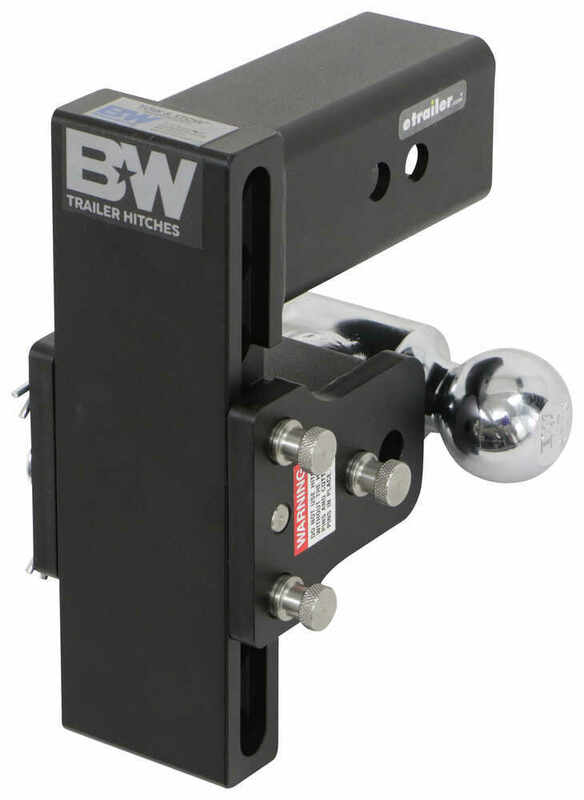 Guaranteed Lowest Price and Fastest Shipping for B&W Tow & Stow 2-Ball Mount - 3" Hitch -7-1/2" Drop, 7" Rise - 21K - Black. Ball Mounts reviews from real customers. Easily stow the ball and mounting platform on this heavy-duty, dual-ball ball mount beneath your hitch for a sleek look when you are done towing. Tow up to 7,500 lbs with the 2" ball or 21,000 lbs with the 2-5/16" ball. 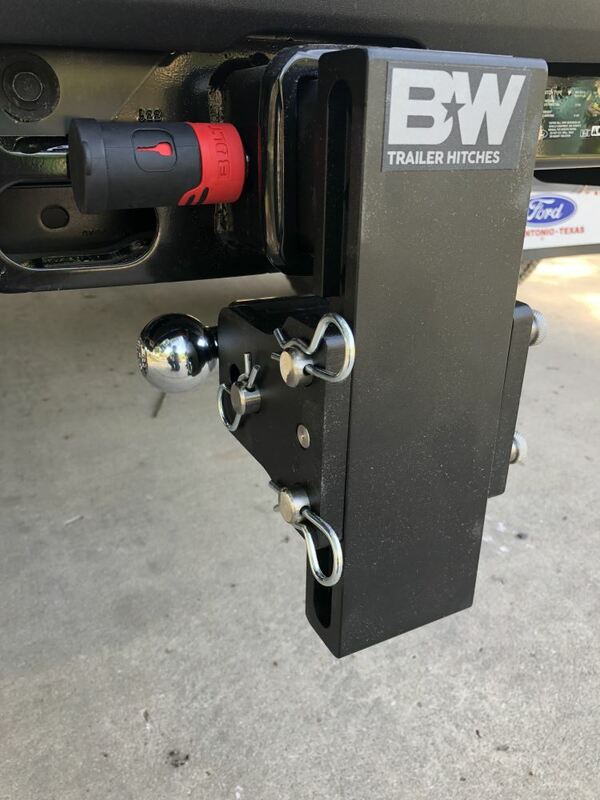 Hitch pin hole closest to ball: 9-1/4"
Hitch pin hole farthest from ball: 10-3/8"
Pin hole closest to mounting block: 3-3/4"
Pin hole farthest from mounting block: 4-7/8"
The B&W Tow & Stow adjustable ball mount lets you tow a variety of trailers with different tongue heights. Having both a 2" ball and a 2-5/16" ball allows for even more versatility, making this the ultimate go-to ball mount if you own multiple trailers. To switch the hitch ball, simply remove the pin holding the balls in place and rotate the entire block that the balls are mounted on until the ball you want to use is on top. Then replace the pin to secure the block in place. Adjusting the height of the ball is just as easy. Remove the pins holding the ball mount platform in place and slide the platform up or down along the shank to the desired position. Once you have found the correct height, reinsert the pins and replace the clips. When you're not towing, you can flip the ball mount platform around and stow it beneath your hitch so that you won't bang your shins. Just remove the pins to slide the ball platform down along the channel and up the back side so that the hitch balls face towards your vehicle. Then replace the pins. 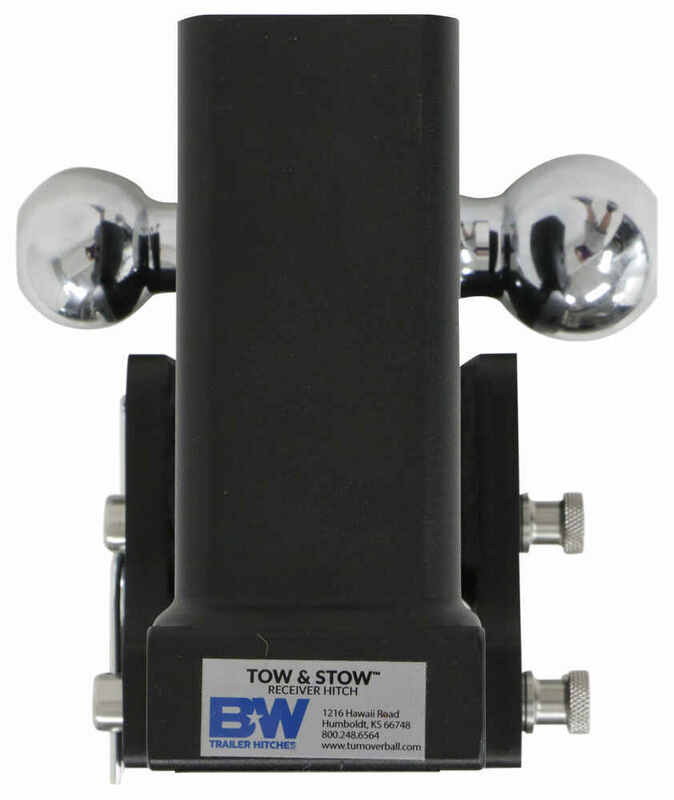 The Tow & Stow ball mount features a channel that runs along both sides of the shank. 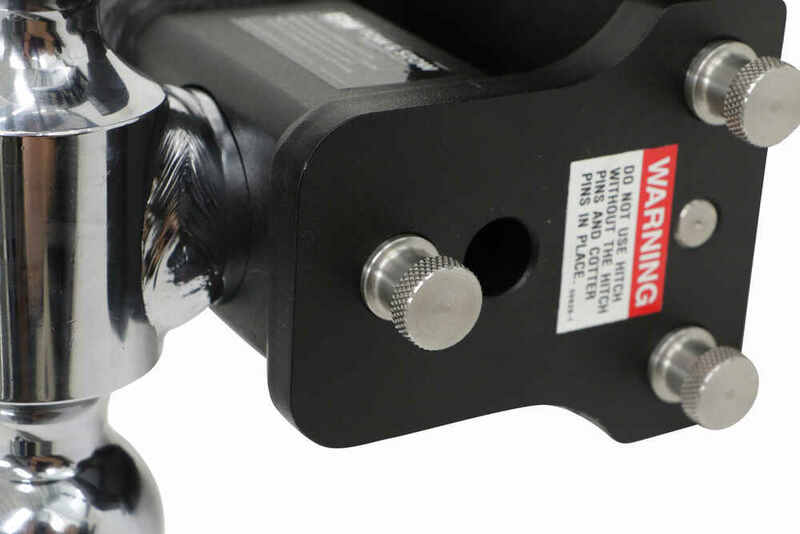 This channel not only allows you to slide the ball mount platform up and down to adjust the ball height, but it also prevents removal of the platform when the ball mount is installed, which will help prevent theft of your trailer. A slot is cut into the adjustment channel near the top of the shank. To remove the ball mount platform from the shank you will need to remove the entire ball mount from your hitch. Then remove the pins that hold the platform in place. Flip the platform around to the stowed position on the rear of the shank, and then slide it up until the center pin lines up with the slot in the shank. Pull the platform out towards the rear of the shank until the pin pops out of the adjustment channel. 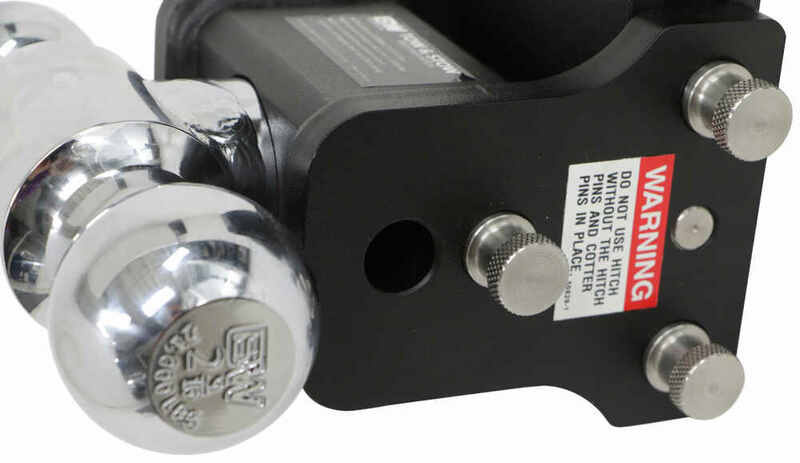 When the Tow & Stow is secured in your hitch receiver, you will not be able to remove the ball mount platform. This is because the slot in the shank is positioned in such a way that the collar on your hitch will block the pin on the platform from being able to leave the channel. Even if the pins holding the ball mount platform in place are removed, the platform will still be confined to this channel. 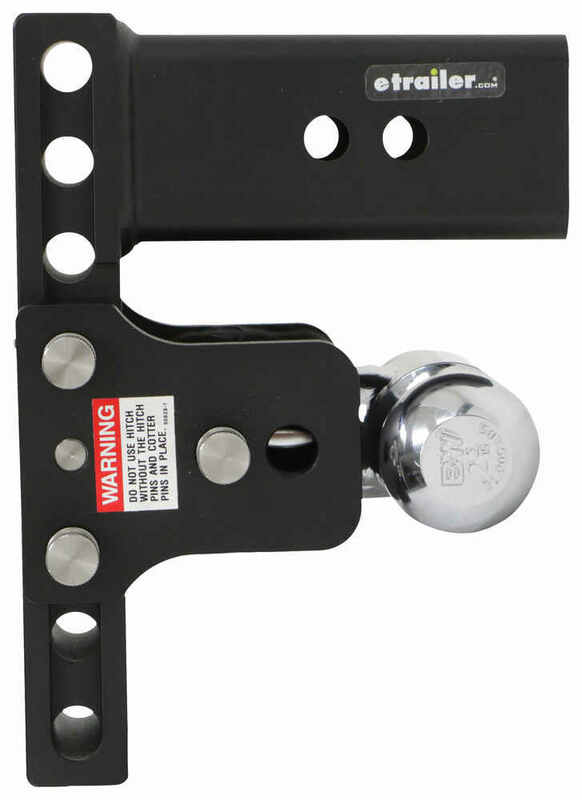 So, as long as a hitch lock is used to secure the entire ball mount in your hitch receiver, and a coupler lock is used to prevent your trailer's coupler from being disengaged from the ball, your trailer will be secure. Easily stow the ball and mounting platform on this heavy-duty, dual-ball ball mount beneath your hitch for a sleek look when you are done towing. Tow up to 7,500 lbs with the 2" ball or 10,000 lbs with the 2-5/16" ball. 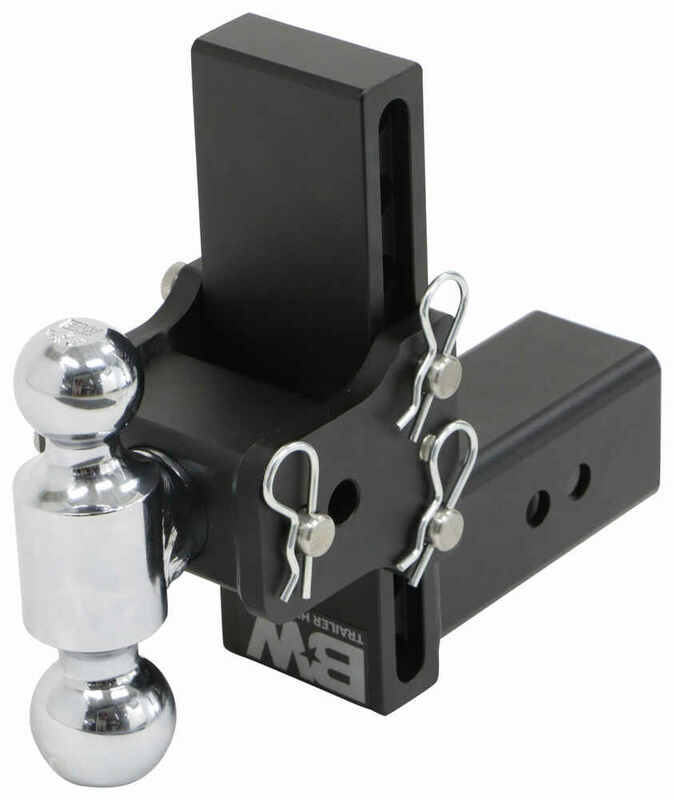 Insert this heavy-duty mount into your 2-1/2" hitch to get 4 stacked 2-1/2" receivers for mounting the included 2" ball, 2-5/16" ball, pintle hook, or other hitch-mounted accessory. Speaker 1: Today we're taking a look at the B and W Tow and Stow Two Ball Mount for three inch by three inch trailer hitch receivers. 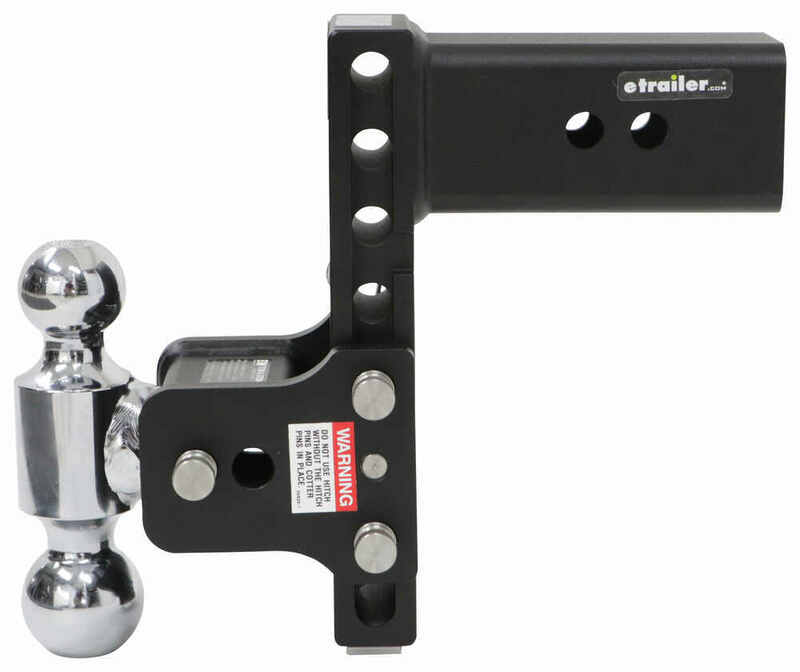 This ball mount with the built in hitch balls lets you hook up your trailer to your tow vehicle. The shank portion slides into the receiver tube of your hitch. And the hitch balls provide the connection point for your trailer coupler. Now, this can be used in either the drop or rise position. So this right here would would be the drop position. You can flip it over and use it in the rise position as well.And one of the neat features about this unit is not only how it's adjustable and that it fits a three inch hitch, but it can actually be stowed when it's not in use. So, the stowable design lets you store the balls and the mounting platform on the reverse side here, which would be underneath the receiver tube of your hitch, or underneath the vehicle. In order to get it to a stowed position you need to remove these two pins and clips. And then, I always like to rotate the ball assembly to the side position, like this. And then that whole platform area actually rotates to be stowed on the reverse side. So when it's not being used, it's gonna give you that flush look at the back of your vehicle.I also want to point out that it is fully adjustable. So, it can slide up and down the shank. The adjustable height lets you tow trailers of different heights using the same vehicle. It also allows you to make sure that the towing setup is as level as possible. You'll notice that it has this slot here in the shank. 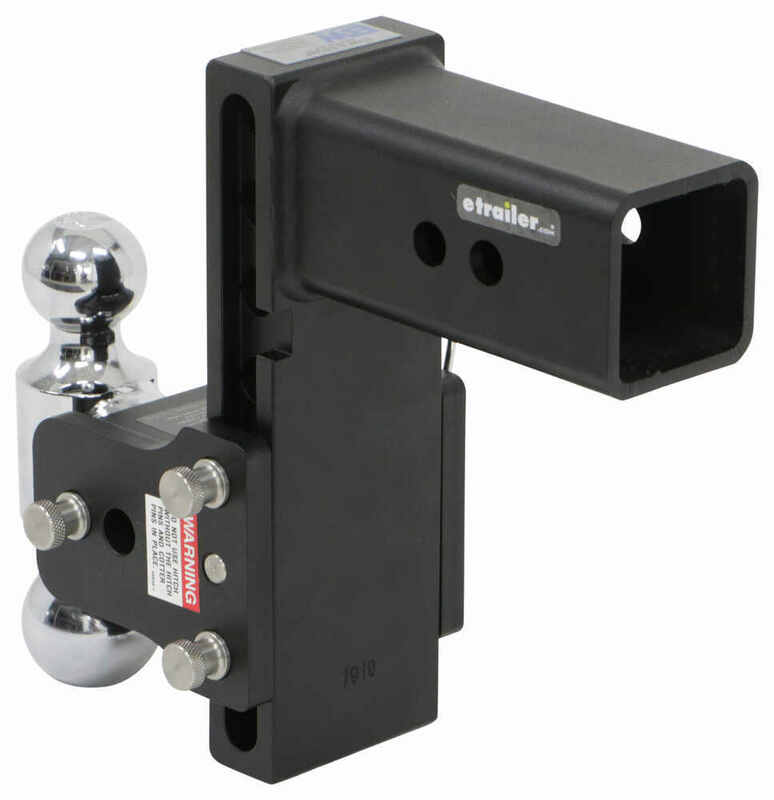 This ensures that the ball mount platform can't be removed when the tow and stow is installed in your hitch. No additional locks are required to prevent the platform and the hitch balls from being removed.You'll notice that it had two differently sized hitch balls on the unit. So it has a two inch and a 2 5/16 inch ball. To switch between the ball you want to use, you remove the pin and clip and then you can rotate it as necessary to the one that you need for your setup. When you have the one that you want, you simply take the pin and secure it in place with the clip on the other side. And then once you find the height you want for your setup, make sure the adjustment holes line up, and secure it in place with the included pins and clips.So it's a nice, easy to use design. Now, the hitch balls are made from steel, and they feature a dual process chrome plating to provide excellent rust resistance. The rest of the unit has a black powder coated finish on it to resist rust and corrosion. And the stainless steel pins create sturdy, rust-proof connections. 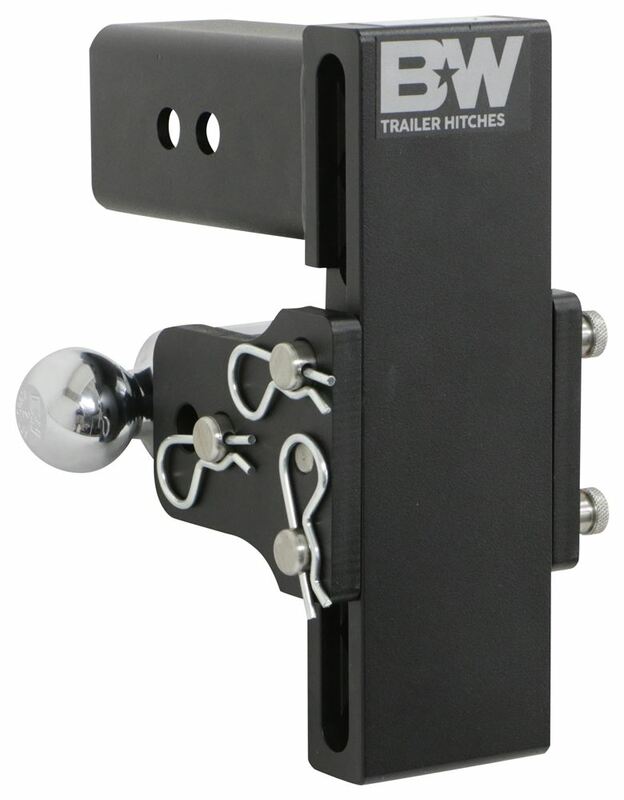 Again, it's made from a durable steel construction with high yield tubing that offers superior strength and durability.To get it installed on your hitch it does require a hitch pin and clip or a hitch lock, those items are sold separately, and available here at etrailer.com. This is designed for a three inch by three inch trailer hitch receiver. When it comes to the gross towing weight, when using the two inch ball, you're limited to 7,500 pounds. When using the 2 5/16 inch ball, it's 21,000 pounds.I took some other measurements. The center of the hitch pin holes, you'll notice that we have two of them on here. You just pick whatever one works best for your application. The distance from the center of the hitch pin hole to the center of the hitch ball, going from the hitch pinhole closest to the ball is 9 1/4 inches. The further back on, center on center, is 10 3/8 inch. When you're using this in the drop position with the unit at the lowest setting it gives you a maximum drop of 7 1/2 inches. That's from the inside top edge of the receiver tube of your hitch to the top of the ball platform. When using the rise position, with the unit at the highest setting, doing those same measurements, it gives you a maximum rise of 7 inches, again from the inside top edge of the receiver tube of your hitch to the top of the ball platform.It features an incremental height adjustment of 1 3/8 inch, that's the distance on center between our adjustment holes. And this product is made in the USA and covered with a limited lifetime warranty. That's gonna do it for today's look at the B and W Tow and Stow Two Ball Mount for three inch hitches. Order: RelevanceNewestRating - High to LowRating - Low to High Easily stow the ball and mounting platform on this heavy-duty, dual-ball ball mount beneath your hitch for a sleek look when you are done towing. Tow up to 7,500 lbs with the 2" ball or 21,000 lbs with the 2-5/16" ball. one year and still going strong. no issues what so ever great product. Love it. I’m a landscaper and wouldn’t want to operate without one. It’s super convenient when swapping my trailers out and the pins and swivel is heavy duty. Worth every penny. For a hitch lock to fit a 3 inch trailer hitch like what you have you would want the Weigh Safe Hitch lock part # WS05. This lock is designed to fit the larger 3 inch hitch size you have so it would work well. 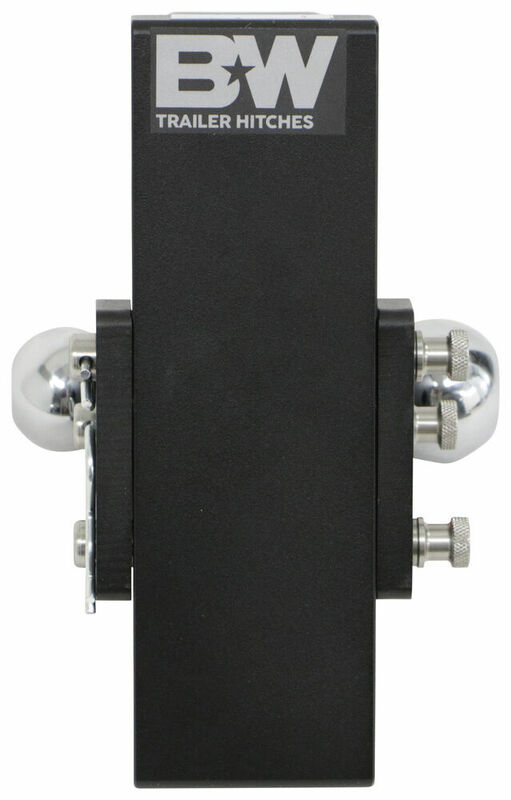 It also will work well with the B&W Tow & Stow 2-Ball Mount # BWTS30040B that you referenced. The Curt hitch part # C15800 is the highest capacity hitch we offer for your 2018 Ram 5500 cab and chassis. The hitch has a 20,000 lb trailer capacity and a 2,700 lb tongue weight capacity. The hitch is also made in the USA and has a 2-1/2 inch hitch opening which is very common for heavy duty ball mounts like what you'd need. 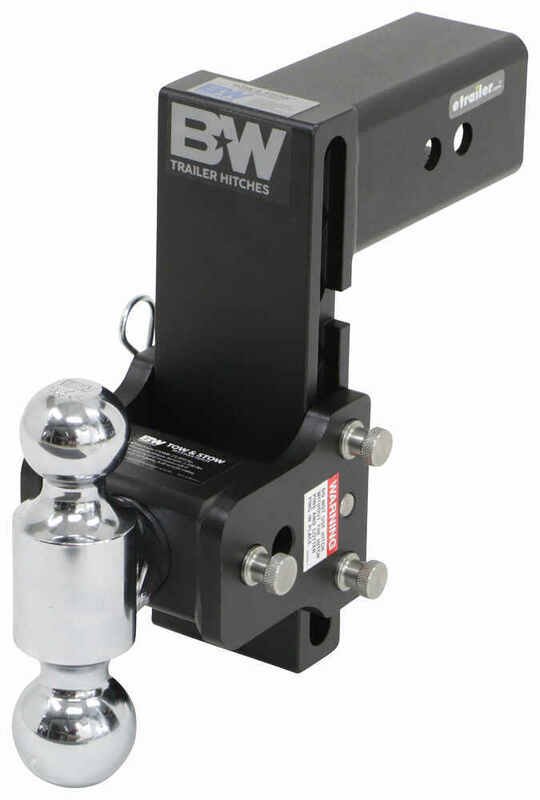 For and adjustable ball mount with two hitch ball sizes we have the B&W Tow and Stow part # BWTS30040B which has a 21,000 lb towing capacity. The DeadBolt brand of hitch locks, such as # 7683 for 2 inch hitches, have proven to be reliable and are highly rated by our customers. They have several options for different size hitches and other applications. I have included a link to the DeadBolt options for you. 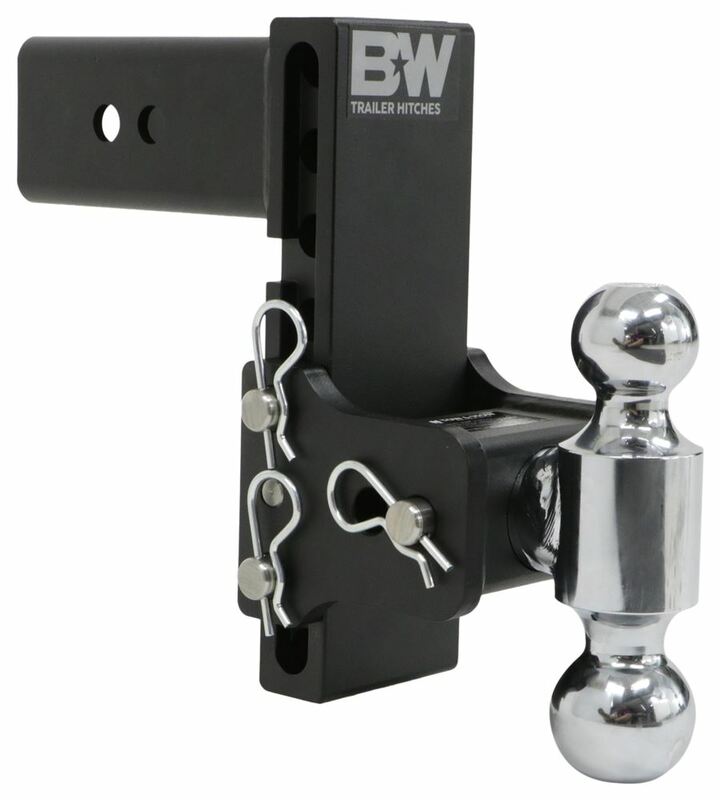 For an adjustable ball mount with 2 hitch balls that fits a 3 inch trailer hitch like what you have you'd want the B&W Tow & Stow part # BWTS30040B which comes with a 2 inch and 2-5/16 inch hitch ball and a 21k capacity when used with the larger ball size.